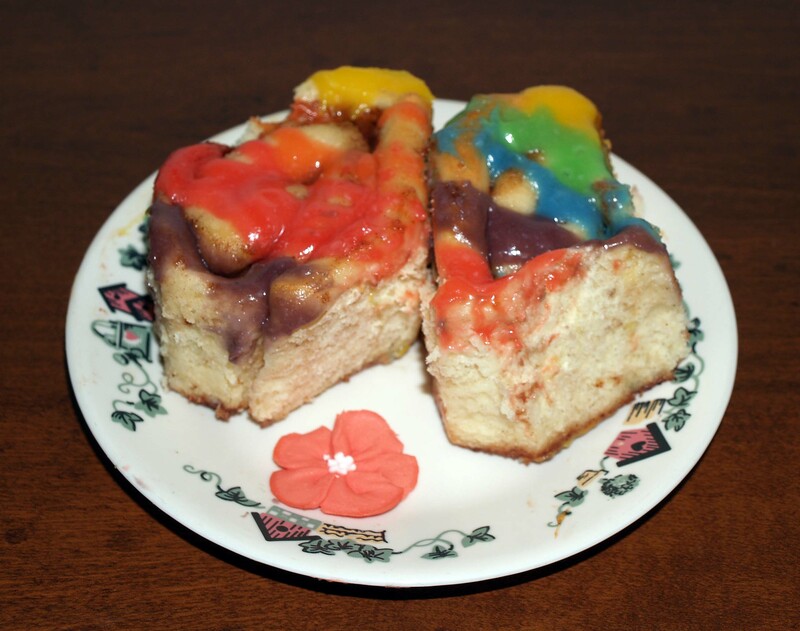 Rainbow Cinnamon Rolls | I Wanna Bake! Unless you live under a rock, you’re probably aware by now that our country made a historic advance in equality last week. I was in the mood to celebrate, so I decided to make some rainbow cinnamon rolls. The rolls themselves, while delicious, are fairly run of the mill. It’s the fun explosion of rainbow on top that tickles my whimsy. Hopefully your cones are similarly stimulated (as are your taste buds). I wanted to listen to Golden Earring, but apparently I don’t have any of their albums on cd, and I didn’t feel like bringing my computer into the kitchen today. Instead, I listened to Queen (after all, it just makes sense for the task at hand). I recommend something that hits your musical sweet spot while you make these deliciously-sweet pastries. Now that you’ve gathered your ingredients, it’s time to make rainbows spring forth from your kitchen! 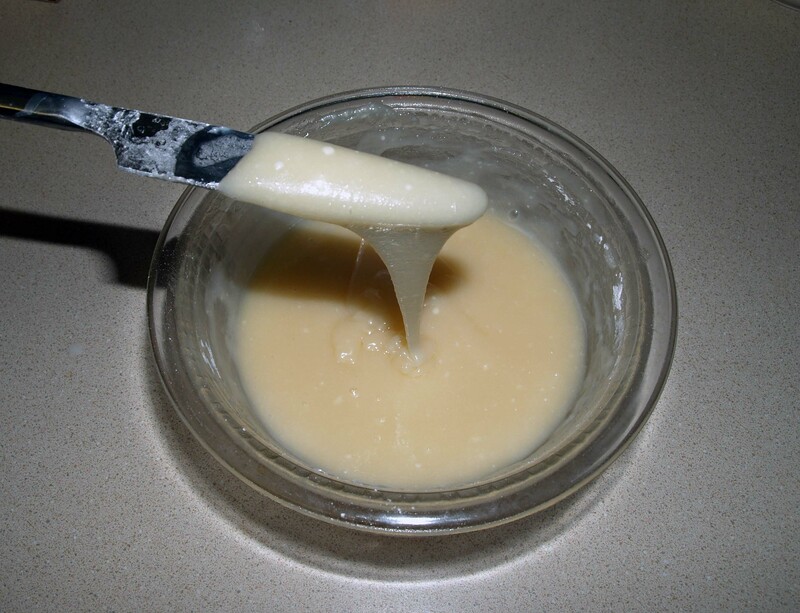 In a stand mixer bowl or other large bowl, dissolve 1 tablespoon of sugar in the water. 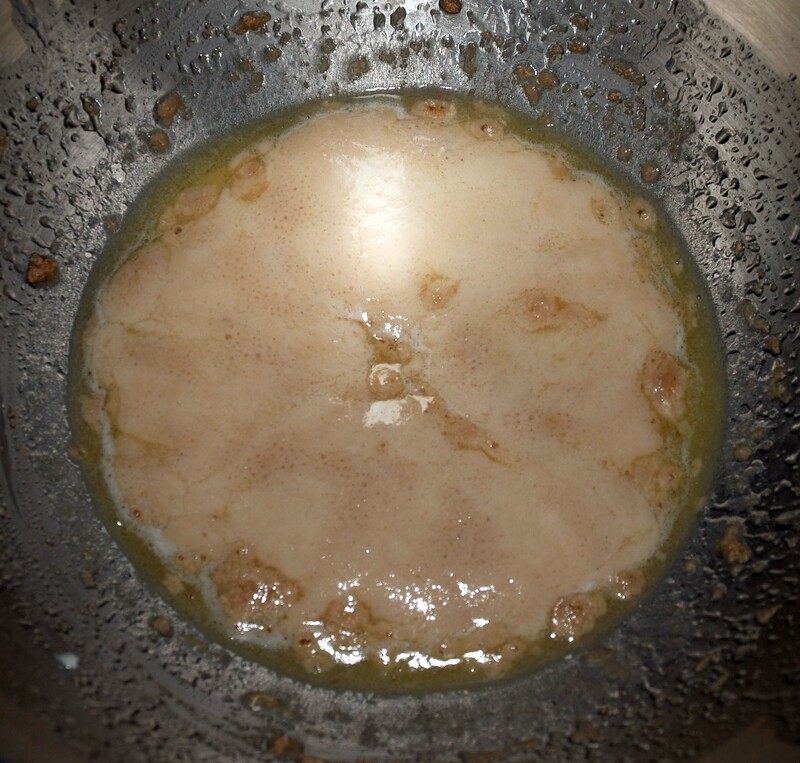 Stir in the melted butter and sprinkle the yeast over the top. Cover and set this aside. 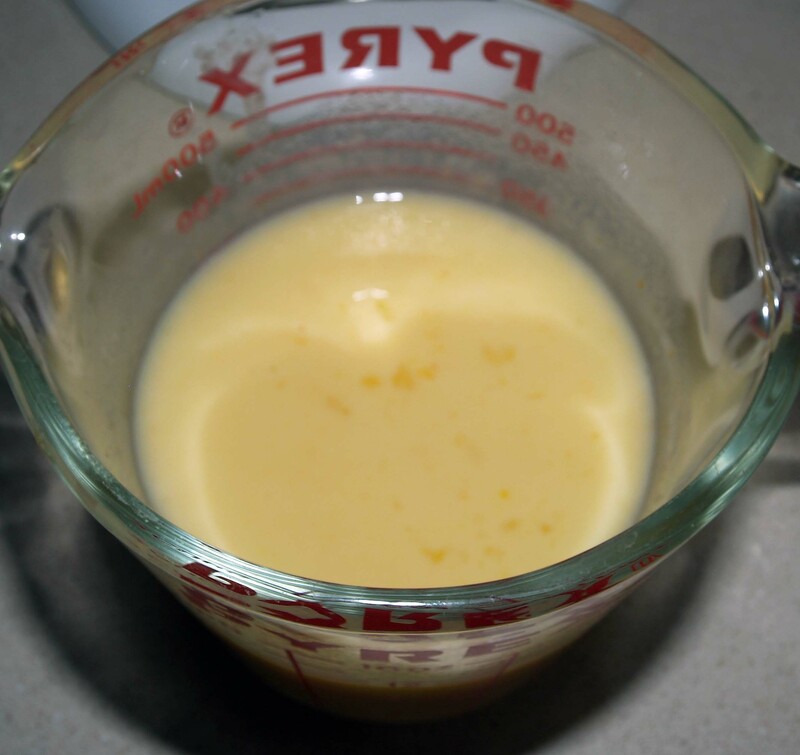 In a small bowl or measuring cup, whisk together the warm milk, pudding mix, and egg until the mixture is smooth. By now, the yeast should have formed a foam on the top of the liquid. Stir in the pudding mixture until well-combined. 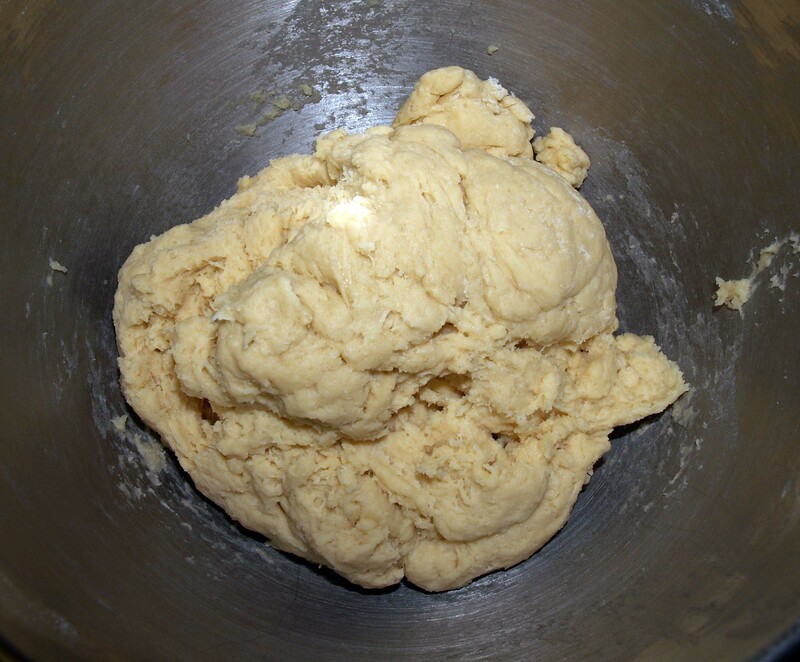 Add the salt and flour and mix, with a dough hook if using a stand mixer or with a wooden spoon (or your hands), until the dough forms a ball. Remove the dough from the bowl momentarily, then grease the bowl (I use non-stick cooking spray, but vegetable or olive oil will work too). Put the dough ball back in the bowl, flipping it once to coat both sides, and cover the bowl with a kitchen towel or plastic wrap. 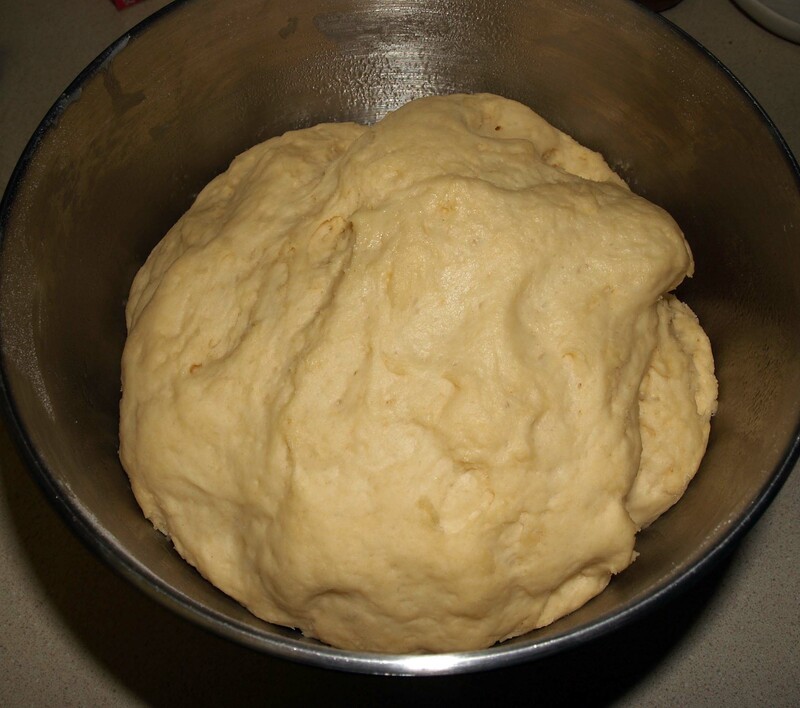 Let the dough rise in a warm place until roughly doubled in size, about an hour. Flour your work surface (I use a silicone mat whenever I want to roll something out). 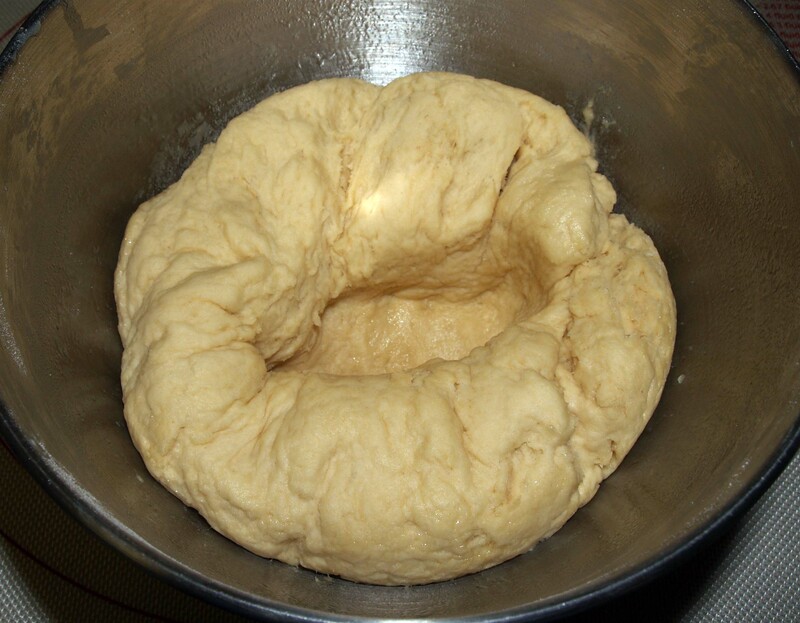 Punch the dough down and turn it out onto your floured surface. Roll it into an 11″ by 17″ rectangle. It may take a little finessing to make the corners square enough, but it doesn’t have to be perfect. Stir together the brown sugar and cinnamon, being sure to break up any large clumps. Brush the 8 ounces of melted butter all over the top of the dough. 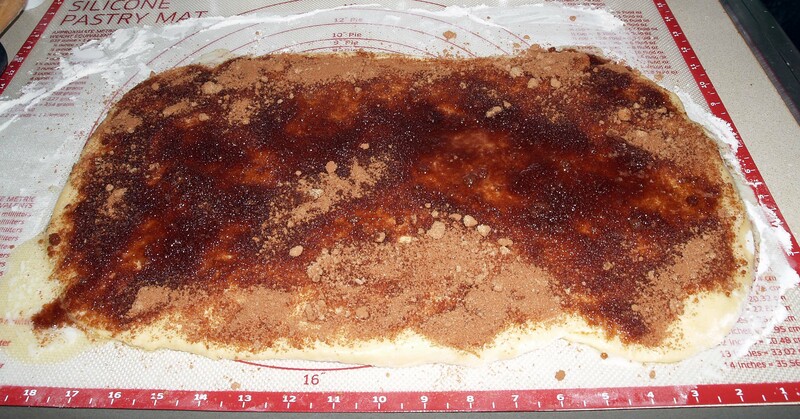 Sprinkle the brown sugar and cinnamon as evenly as possible across the dough. If you have butter leaking off the dough, put the sugar there first to stop the flow. 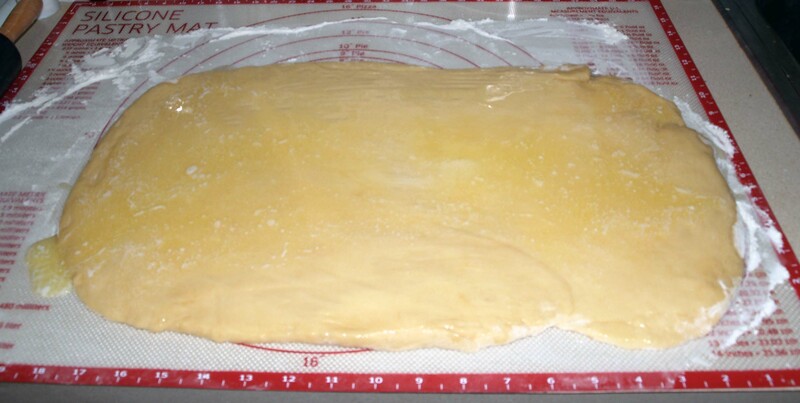 Grease a 9″ by 13″ baking pan (it should have sides at least 2″ tall). 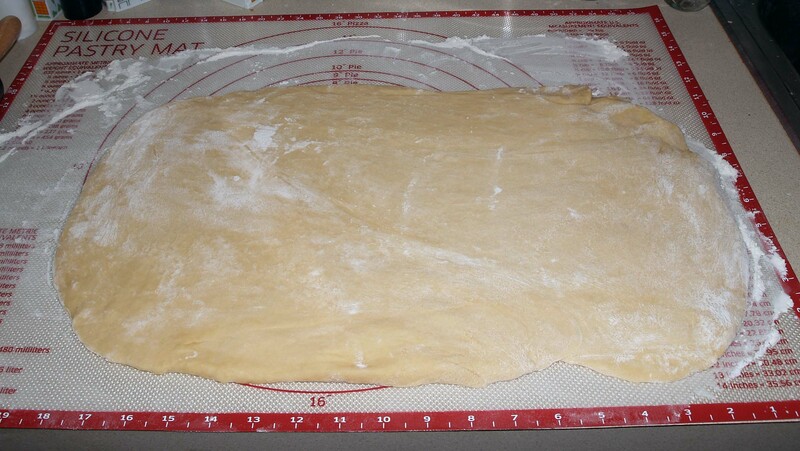 Starting from the long side, roll the dough rectangle into a log. It doesn’t have to be perfectly tight. Now slice the log into 16 rolls (I started in the middle and kept cut each piece in half until I had 16 total). Place the rolls in the prepared pan and cover with a towel or plastic wrap. Let them rise until doubled in size, about 45 minutes. Preheat your oven to 350°F. 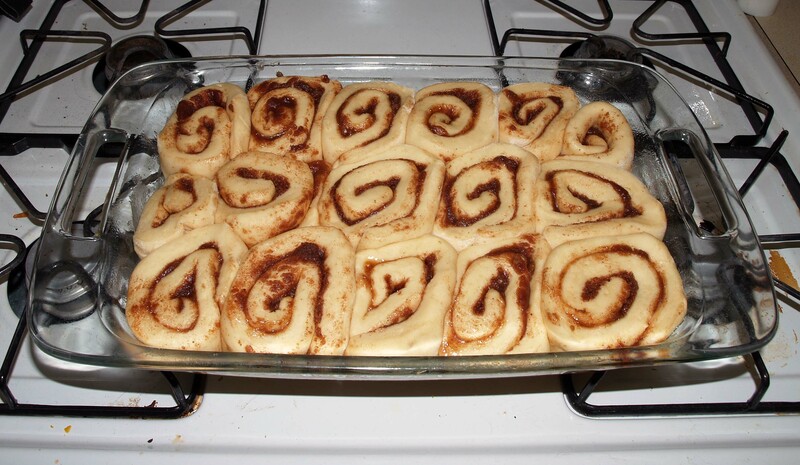 Bake the cinnamon rolls for 15-20 minutes, or until the tops start to brown. While your cinnamon rolls are cooling, prepare your icing. 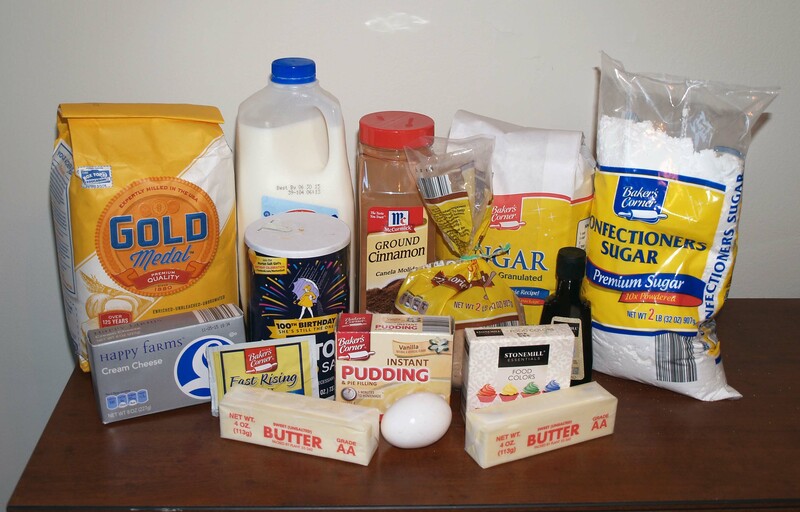 Stir together the butter, cream cheese, powdered sugar, vanilla extract, and milk in a small bowl until it is smooth. If you have no interest in rainbow cinnamon rolls (this is probably for those under-rock dwellers), you can spread this on the rolls as-is when they have cooled for about 20 minutes. If you are looking forward to an explosion of rainbow, divide the icing between six resealable plastic bags (seven if you can figure out how to distinguish indigo from purple and blue with food coloring). Put 3 drops of food coloring in each bag to make your rainbow colors. For mixed colors like orange, either try to put 1 1/2 drops of each color you need, or decide which color you would like to be dominant and use two drops of that and 1 drop of your secondary color (i.e., to make red-orange, use two drops red and one drop yellow). Knead the bags with your hands until the colors are uniform. 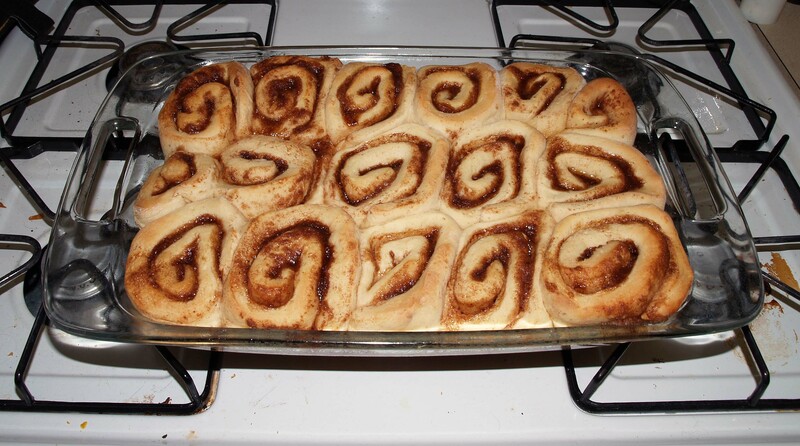 Cut 1/4″ off the corner of the red bag and squeeze the icing in diagonal stripes across your cinnamon rolls. Repeat with the rest of the colors until you have none left and there is a glorious rainbow of deliciousness daring you to eat it.